Buying a property on Koh Chang has become more popular as the island has continued its steady development into a fully fledged tourist destination. The market is still nascent, with properties shifting slowly rather than at breakneck speed but compared with a just a few years ago, there is now much more on offer in terms of villas, resorts, land and businesses for sale. 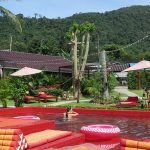 On this page, we have put together a basic guide to buying a property in Thailand, with some additional information specific to Koh Chang. You can jump straight to the different sections immediately below. Buying a property in Thailand falls into two categories, freehold and leasehold. From a foreigner perspective, freehold only applies to buying a condominium in a development. According to the Thai Foreign Ownership Allocation law, 49% of the units in a new build are allowed to be owned freehold by foreigners, with the remaining 51% owned by Thais freehold or sold leasehold to other foreigners. You will need to bring the purchase funds into the country and have proof of this from a Thai bank in a form known as an FET (Foreign Exchange Transaction Form) but all done and dusted, you can indeed own a condo outright. A foreigner with a Thai partner may choose to buy the land or property in their partner’s name. This involves a huge amout of trust on the foreigner’s part as make no bones about it, should circumstances change, they have no legal comeback whatsoever – if in a Thai name, the land or property is solely owned by the Thai even if the foreigner contributed the finances to make the purchase. One way that couples get round this is for the foreigner to take out a long registered lease on the property (see below), though an annual tax and rent then need to be paid. A foreigner (or a company) takes out a long lease on the land or property of 30 years and gets the lease registered at the local Land Registry Office, paying the tax at 1.1% (1.0% + 0.1%) on the total value of the complete lease. In theory, you can pre-pay to allow the lease to be re-registered twice for a further 30 years each time, giving a total of 90 years, but this is a grey area with different law companies giving often conflicting advice as to its legality. What is clear is that only one period of 30 years can legally be written into the lease contract and you will need to return to the Land Office to re-register the 2nd 30 years and the 3rd 30 years. You can and should also get clauses inserted into the contract allowing you to own or buy the land should the law change to allow foreign ownership, sell it on to another party, sub-let it and in the event of circumstances changing, pass it to a family member or in the event of death, pass it on to a next of kin. Under Thai law, a foreigner can set a up a Thai Limited Company, with 3 shareholders the minimum required, one of which needs to be a Thai National. 51% of the shares must be controlled by Thais. The company must have at least one director who can be either Thai or a foreigner. This company is then used to buy the land or property, with the company needing to have share capital equal to or higher than the value of the property being bought. The legal trick used to give the foreigner security is that company itself is re-structured shortly after its inception so that the foreign shareholders have the majority voting rights and so in actuality control all aspects of the company from assets to bank accounts. There are 2 drawbacks with this method of purchase. 1) It is illegal to use a foreign owned company to buy land or property. However, there is no evidence that any land or property has ever been seized back by the government if purchased in this way and yes, it is widely used to circumvent the law. 2) The actual purchase and registering of the purchase at the Land Office will be done before the company has been switched to the foreigner having majority voting rights, so there is a large element of trust between the foreigner and their lawyer. Costs to set up a Thai company are around 30,000bt (for a 2,000,000bt capitalisation) and note that annual audits, accounts and balance sheets will also need to be done. A Thai company may also be included as part of any property sale whereby the existing owner/director (seller) is swapped out and the new owner (buyer) is swapped in as director. Your due diligence (see below) would verify the existing company to see this will indeed work, that they are on the leasehold and that the new director, you the buyer, has the majority voting rights. Land is measured in Wah, Ngan and Rai, with 100 Wah in a Ngan and 4 Ngan in a Rai. Land is normally listed in Rai, housing tends to use Wah. There are four main types of land title deed. The best and most secure land title deed is known as Chanote. This is GPS measured for area and boundaries, with unique markers on each corner of the land, which correspond to those on the scale map of the plot on the title deed itself. The rear of the title deed shows the names of previous owners, information on any bank loans secured against the land and also any existing leesee. Can be divided up into 9 plots (more if in possession of developer’s licence). Very similar to Chanote, Nor Sor Sam Gor land has been unofficially surveyed and correlated to aerial photographs and satellite. It has not been surveryed by the Land Office, so will not have the markers as above. Right to ownership, however, is fully confirmed by the Land Office. The plot will be marked on the title deed with natural/human-made boundaries – rivers, roads etc. The rear of the title deed shows the names of previous owners, information on any bank loans secured against the land and also any existing leesee. Chanote and Nor Sor Sam Gor are both accepted and used by Thai banks as mortgage collateral. Both title deeds can registered for ownership or for a lease. When buying in Thailand, these are the two titles deeds you want, with the preference for Chanote. Nor Sor Sam is the least definite Thai land title. The Land Office has certified that the owner has occupied the land, put it to good use and grants rights of possession, but these rights have yet to be officially confirmed. Any transactions (buy, sell, mortgage) must be published at the Land Department without opposition for 30 days before they can be registered. The land may have been surveyed against adjacent plots, but the surveys have not been correlated with a master survey or satellite photo or with adjacent plots. Can be divided up into multiple plots. Essentially, Por Bor Tor 5 is farmland where the occupier has paid tax on the land but has no right of ownership. Cannot be registered, held in Thai name only. Although very low in Thailand, it is worth having an idea of tax and duty applicable to buying a property or land and who of the seller and the buyer or leesee pays what. As a rule of thumb, estimate taxes at between 5% and 7% of the sales value, with obligations split as shown below. There are 2 valuations against which tax or duty is collected – the Commercial value (i.e. the sale price) and the Assessed or Government value (what the Land Office deem the land or property to be worth, much lower than the commercial value). When registering the lease at the Land Office, the leesee pays 1.0% of the total lease value directly to the Land Office. The Transfer Fee on a property sale is currently calculated as 2% of the Assessed Value of the property or land – usually paid by seller and buyer. Specific Business Tax applies if the seller is a company (exemptions do apply so check at the time) or if the seller is an individual selling on the property within five years of the original purchase registration date. This tax is imposed at a rate of 3% plus a municipal tax of 10% assessed on the amount of the SBT bringing the total tax rate to 3.3%. Paid by seller. Stamp duty, payable on both property sales and leasehold transfers, is charged at a rate of 0.5% of Assessed value of the land or at 0.1% in the case of a lease. Paid by seller if sale transfer, paid by leesee if leasehold transfer. Company: If the property is being sold by a company, withholding tax is deducted at a rate of 1% of the higher of the Commercial value and the Assessed/Government value. Paid by seller. Individual: If the property is being sold by an individual, withholding tax is deducted at a rate of between 5% and 35% on a rising scale depending on the amount of revenue received. The amount of the revenue that is subject to withholding tax is reduced on a scale based on the number of years that the property has been occupied. Paid by seller. With ownership, there are no general property taxes, though properties put to commercial use (residential houses not ‘owner occupied’ and commercial buildings) must under the Building and Land Tax Act pay a ‘rental’ tax at a rate of 12.5% of the annual rental value. For undeveloped land, there is a very small annual local land development tax depending in the size and use of the land – (building and land tax). Your lawyer and accountant will of course deal with all the logistics in payment of tax. Please email at explorekohchang@gmail.com if you are interested in our properties for Sale in the Koh Chang Islands. To stay in Thailand long term, you will need to get a visa, although there is actually nothing to stop you signing basic lease contracts (unregistered) when on the standard 30 day visa exemption stamp you receive at the Airport. The SETV (Single Entry Tourist Visa) is easily bought from an embassy or consulate in your own country or indeed a neighbouring country. Cost is around $60. Once bought, it must be activated within 3 months. This entitles you to stay in the country for 60 days with another 30 possible if you extend at a local Immigration Office (1,900bt). As it is single entry only, please note if you leave the country it is no longer valid and you lose any remaining days. To get round this, if you do need to exit/return to Thailand, you can get a single re-entry permit at 1,000bt from a local Immigration Office. This entitles you to return to Thailand and pick up the remaining visa days. Once in Thailand, you will need this at least this type of visa to convert upwards to a Non Immigration O (business/retirement/spouse). If coming here to potentially buy property and get your ducks in a rows for re-settling, get an SETV (Single Entry Tourist Visa) from your own country before you come. It will save you the considerable hassle and expense of having to hurriedly visit a neighbouring country to get one. The METV (Mutiple Entry Tourist Visa) is bought from a consulate in your own country. Cost is around $120 and there are income/work place criteria which need to be met for a successful application. This visa entitles you to stay in the country for 60 days with another 30 possible if you extend at a local Immigration Office (1,900bt). As it is mutiple entry, you can leave and return to Thailand as many times as you want within the vaildity date of the visa. Each time you come back in you get another 60 days, so if timed correctly and you leave just before it finally expires (the valid until date), you will end up with 9 months legal stay in Thailand. If over 50, you qualify for a renewable 1 year retirement visa. If applying in Thailand, you need 800,000bt held in a Thai bank account, with the money needing to be in place for 3 months before application. You also need a Thai address. You can also have a combination of income and money – 400,00bt in the bank and monthly income such that the total equals 800,000bt. You can also use an embassy affadavit showing income from your own country at 65,000bt a month. Check also at your own local consulate/embassy as selected countries can issue adaptations of them which make things so much easier than going through the process in Thailand. If buying a business with the intention of working, you will need to get a business visa before the Labour Department would consider your application for your work permit. Alongside all the paperwork, a strict criterium is in place for the issuing of work permits, whereby a company must employ 4 Thai staff to employ one foreigner. On a monthly basis, the company must pay the social security contributions for those 4 Thai staff (around 3,800bt per month). You can of course always get a business visa when you form your company, renewable 1 year and not work. If married to a Thai and/or have a Thai child, you can stay in Thailand on this 1 year renewable visa. The criteria which need to be met are 400,000bt in a Thai bank account for a period of three months prior to the visa application or to show income into a Thai account of at least 50,000 Baht per month – each year. If over 50, you can also qualify for this longer form of retirement visa, which gives you a full 5 years. The criteria which need to be met are 3,000,000bt in a Thai bank account for a period of 1 year prior to the visa application or 1,800,000bt in the bank combined with a monthly income of 100,000bt (proof via embassy affadavit). Annual report to check criteria are still being met. For this special visa aimed at the wealthier ex-pats, you can get more information here. With all long term visas, whether retirement, extended retirement, business or spouse, you will still always need to report to a local Immigration Office every 90 days, no exceptions. With long term visas, the visa itself is issued only once at the beginning. Provided you continue to meet the criteria each year and yes, that involves more paperwork, photos and money, you are then issued annual extensions, not a new visa each time. With tourist visas, on expiry, you are always issued with a new visa. Your lawyer can organise all these Non-Immigration visas. For business visas and work permits, you will most likely opt to continue using them each year for extensions. For Retirement and Marriage/Dependency visas, you should be able to do it yourself, so making things much cheaper year on year. At some point or other, anyone buying property in Thailand will need to use a lawyer to oversee aspects of the sale such as due diligence, set up a company or obtain a long term visa. Due Diligence is often split by Bangkok lawyers into corporate and property. Corporate will involve a review of corporate documents, shareholding structure, and tax certificates, and any other official documents related to the transaction, investigation at the relevant administrations and issue of a report. Property will review the land title deed, construction document and any other official documents related to the transaction, investigation at the Land Department and issue a report. In layman’s terms, what you need to get from these reports is that the company structure is sound, no taxes are owed or debts offset, land is owned bona fide with no ongoing disputes, that borders are indeed as marked and what the Assessed value of land is from the Land Office. The lawyers should also explain the contract highlighting any added clauses, any penalties due to the seller/buyer for its transferal from one to another, rent increase agreements over its duration and future arrangements for extensions on its expiry. With buildings diligence, the report also needs to establish that buildings have correct permissions and that future buildings will be allowed or if there are any restrictions. It should also cover utilities. If buying a business, you will also want to look over the company books. In an ideal world, the seller will provide very well kept figures, with clear income and expenditure breakdown. Unfortunately, such books are rare as Thailand is a cash world with minimal taxes so a buyer should not be suprised if there is not too much to analyse – it is not always a bad sign so much as as a reflection of a different culture. Be aware too, books are more often than not non-verifiable as auditing is done for low taxes in Thailand rather than accuracy. Buyers too are more likely than not looking to bring their own ideas to the table so what a business does now is only a guide to what may be possible going forward with fresh ideas and impetus. Of course, you should get several quotations. Bear in mind also that you can cherry pick what you need as not every purchase nor indeed you the buyer will necessarily benefit from having a full corporate style analysis. Landlords on Koh Chang do not universally sign off on registered leases, with whole areas on the west coast in particular where they are simply not interested in going down that route. 3 year rolling leases are the norm, with some parts in the far south only offering renewable 1 year leases. When looking into buying property on Koh Chang, therefore, you will often see leases stating a length of time of say 15 years or even longer (3 years + 3 years + 3 years etc), with annual rental rates agreed for the duration (5% to 10% rent increases every 3 years are the norm) and clauses inserted agreeing future extensions at the end of the whole contract. To be clear, if this lease has not been registered at the Land Registry Office, whatever the contract states, it is still only legally of maximum 3 years duration. This means that the landlord is perfectly within their rights not to renew after 3 years if they so choose (with a notice period observed as per the contract). Note of course that the landlord can stop the contract if you break the rules of said contract, by not paying your rent on time annually or say sub-letting without their permission. Many foreign owned businesses on Koh Chang are on these rolling 3 years + 3 years contracts, with the leesees fully aware but unfazed. It is almost unheard of that the landlord does not stick to their word and continue to rent as per the contract, so the registering of it has never been a issue. As a buyer, however, it is best to be fully aware of where you stand and you can make your decisions accordingly. No one size fits all when buying on the island and as much as advice and rules are laid out, you’ll find it broken quite happily by buyers before you. As the propety market develops, registering contracts becomes a more frequent question and so landowners now may agree to do it, but only in return for a fee – normally a % of the sale price. Similarly, payments to the landlord for allowing a seller to sell on an existing contract to a buyer are also frequently written into those contracts or an automatic % increase to the annual rent. Business is business in Thailand and the landlord knows they hold many of the cards which ensure a sale goes through to the satisfaction of the all sides. Always check, therefore, what you as the buyer may be liable for. Different areas of the island have vastly different rates for the annual lease/rent, with White Sand Beach for example much more expensive that Bailan. When you assume a contract from the seller, you start at the rate already set or at new one where the % increase is already included an written into the lease. Re-negotiation will never result in rates going down. On the whole, we recommend using a lawyer from Bangkok or Pattaya rather than one based either on Koh Chang or Trat to avoid any possible conflicts of interest. That said, the firms based in Trat do carry out much of the accountancy and book-keeping on the island and with that, deal with long term visas and company set-ups as routine. Some people choose to go to a one stop shop, others may use Bangkok for one part (due diligence) and Trat for others. Checking out location, annual rent, foot traffic, occupancy on different days of the week, times of year are also easy due diligence techniques that can be employed on the ground in Koh Chang by the buyer. Remember it is has a longish low season from May to October where business in some areas is very quiet throughout or quiet in May/June/September but with a good pick-up in July and particularly August. The Koh Chang property market is still finding its feet, with prices only now slowly settling at what the market dictates. Sellers and buyers are often not in a hurry so businesses, villas and houses can sit for a considerable time with one side not reducing and one side not moving until that reduction is made, a sort of stalemate. In many cases, however, properties do end up moving at or near their asking price, as whatever calculations may be made by the buyer on investment vs return, moving to a Thai island is often as not about a change of lifestyle. That ultimately means all property on Koh Chang is worth what the buyer is prepared to pay for it based on the criteria they set out for themselves – and those criteria are not always strictly to the book. Most property on Koh Chang is sold with fixtures and fittings. As a side issue in your planning, always remember to set aside a budget for the extras – the lawyer, the visa, the company, a basic fee for the lease registering, taxes and of course initial outlay and cashflow. As a rough guide, factor in 500,000bt. Any lease registration fee is of course a moveable feast dependent on the value of the lease.